야류(들놀음)는 경상남도 내륙지방에서 행해지던 오광대가 바닷길을 따라 수영·동래·부산진 등에 전래된 것으로, 야류란 이름은 넓은 들판같은 곳에서 놀기 때문에 붙여진 것이라고 한다. 오광대가 전문연예인에 의해 행해진 도시가면극이라면 야류는 비직업적인 연희자들, 즉 마을사람들에 의해 토착화된 놀이이다. 동래야류는 정월 대보름 저녁에 벌어졌는데, 그 해 농사를 점치거나 풍년을 기원하는 의미로 행해졌다고 한다. 정확한 시기는 알 수 없으나, 약 100년전 인근 수영야류를 보고 시작되었다고 전해지며, 근래에는 대중오락적인 놀이로 공연되고 있다. 놀이는 문둥이춤·양반과 말뚝이의 재담·영노춤·할미와 영감춤의 4과장으로 구성되어 있으며, 놀이에 앞서 가면과 의상을 갖추고 음악을 울리면서 공연장소까지 행렬하는 길놀이를 한다. 등장인물로는 원양반·둘째양반·모양반·영감·할미·제대각시·봉사·의원·무당·상도꾼 등이 있다. 줄거리는 양반에 대한 조롱과 모욕이 주를 이룬다. 탈은 대부분 바가지로 만드는데, 양반들 탈의 턱 부분을 움직이게 하여 재담을 할 때 마치 살아있는 사람의 얼굴처럼 턱이 움직이는 것이 특색이다. 반주악기는 대체로 타악기를 사용하며, 굿거리장단에 맞춰 추는 덧뵈기(탈놀이)춤이 주를 이루는데, 특히 말뚝이춤과 양반춤이 대표적이다. 동래야류는 같은 계통의 오광대 탈놀음과 달리 오방신장춤과 파계승에 대한 풍자, 사자춤 등이 빠져 있다. 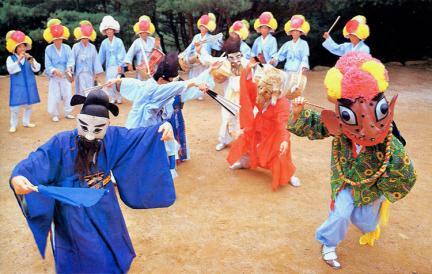 Yaryu is a custom of Ogwangdae (mask dance drama) that was first performed in the inland areas of Gyeongsangnam-do but spread to Suyeong, Dongnae, and Busanjin. Yaryu literally means playing in an open field. 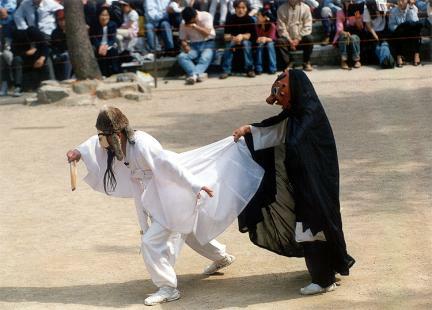 This mask play was performed by non-professionals like villagers. 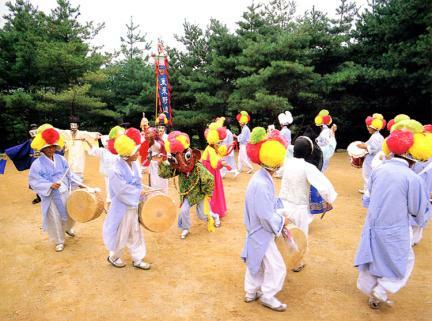 Dongnae Yaryu was performed on the evening of the full moon of January 15 on the lunar calendar, supposedly to pray for a good year for crops. 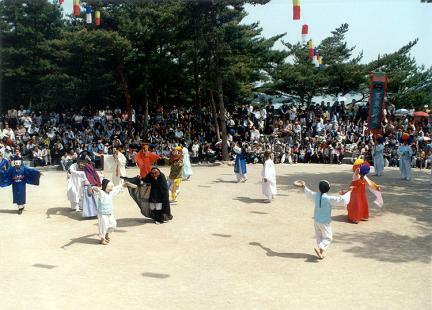 Dongnae Yaryu was said to have been started about 100 years ago after its cousin performed in nearby Suyeong. 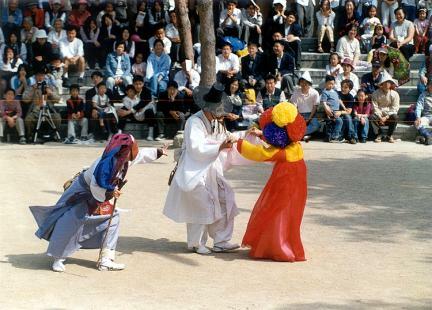 Now performed as an entertainment, it is composed of four acts: leper dance, gag exchanged between a yangban (nobleman) and Malttugi (servant), Yeongno (therianthropic character)’s dance, and old couple’s dance. 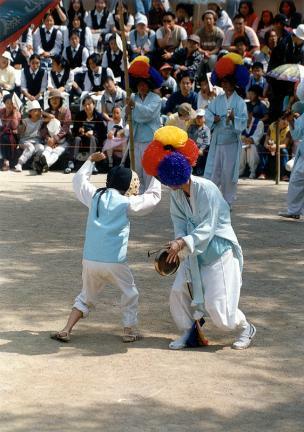 Members of the troupe march to the site of performance while playing music. The main subject of the performance is a satire about nobles. 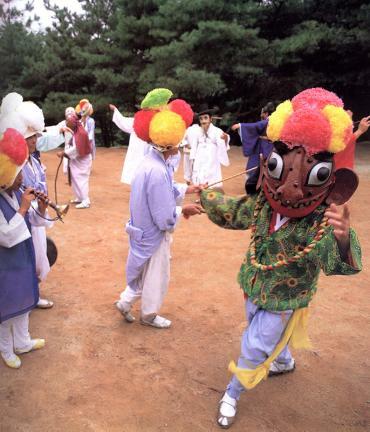 The masks are made of gourds. 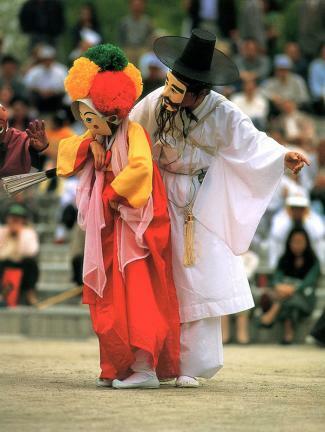 The chin part of the masks is made movable, moving upward and downward while its wearer delivers a gag. 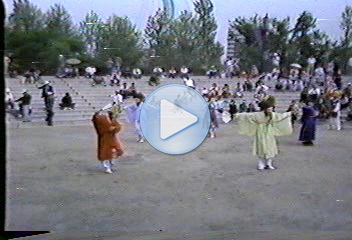 The play is performed to the accompaniment of percussion instruments, which play exorcist music. 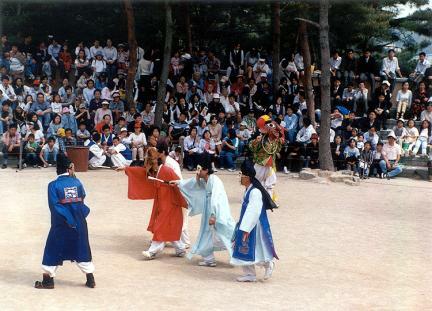 Malttugi’s dance and nobleman’s dance are the leading performances. 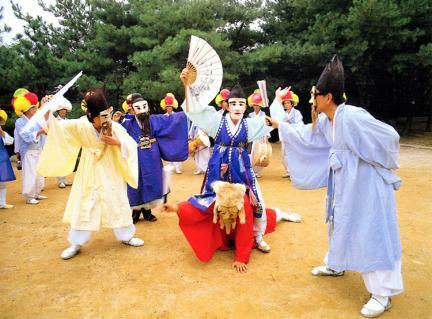 Obangsin (Deities of the Five Directions)’s dance, satire about deprave monks, and lion dance -- which are usually included in Ogwangdae mask dance drama -- are not performed in Dongnae Yaryu.